"This sandwich is super easy to make, and children can help with the assembly or, if supervised, the waffle iron. Use multigrain or whole wheat sandwich bread for a chewy treat." Arrange tomato slices on a work surface, pouring off any excess juice. Season tomato slices with salt and pepper. Spread 1/2 teaspoon butter onto 1 side of each bread slice. Lay 1 bread slice, butter-side down, in the hot waffle iron. Spread 1/2 teaspoon mustard onto bread slice in waffle iron; top with 1/4 cup spinach, 2 slices mozzarella cheese, 1 teaspoon onion, half the tomato slices, and 1/4 cup spinach, respectively. Lay 1 slice bread, butter-side up, atop the spinach layer. 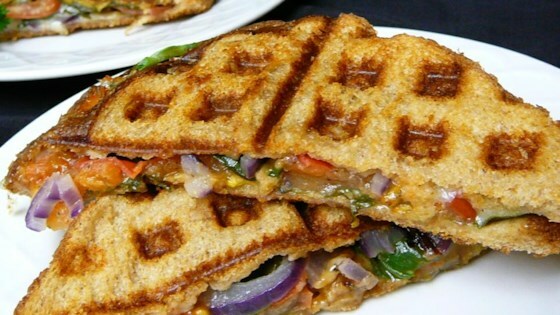 Close waffle iron and toast sandwich until lightly browned, about 2 minutes. Repeat with remaining ingredients. Discover the technique that makes the cheesiest grilled cheese sandwiches ever!